Spring break is here, which means families from all across the U.S. will be vacationing to warmer locations via car, plane or even train. Planning a vacation or cross-country trip is no easy feat, especially when you’re organizing an itinerary for the entire family. The process can be tiresome and it can be hard to come to an agreement on what events everyone should participate in. To ease the burden, notably for parents, an app called Cozi helps families stay organized so everyone is on the same page before taking off for vacation. Founded in 2005, Cozi is a family technology company that’s dedicated to simplifying everyday life for families. Cozi’s Vice President of Marketing, Kati Chevaux, spoke with RewardExpert about some of the cool features of the Cozi app and how families can use it for vacations and everyday life. The company’s flagship product is the Cozi Family Organizer, which does for family life what an organizer would do for a desk. It helps families coordinate their schedules and streamlines communication so everyone has the most up-to-date information for their daily schedules. Let’s go over the top reasons you should use Cozi for your next family getaway. Cozi organizes everyone’s schedules, activities and appointments all in one place. Cozi’s shared family calendar can be color-coded so parents can see everyone’s schedule at once or filter by individual. A quick weekend trip to the beach might not be too difficult to plan, especially if everyone is staying in one place, but where Cozi really shines is for specialty trips and multi-city trips. For example, cruises and resorts are meant to entertain families and keep people on the ship or resort, so they are packed full of different shows and events that appeal to all ages. With Cozi’s shared family calendar, each family member can add their interests to the calendar, so mom and dad know exactly where everyone will be and when to expect them back. This can be a crucial tool, too, for specialty vacations like a trip to Walt Disney World. Another great feature about Cozi’s Calendar is that it will send reminders to keep everyone on track and Cozi Today gives you a glimpse of your day in an easily digestible format. “Cozi’s To Do List feature can help families plan the vacation ahead of time and make sure everything gets done before heading out the door,” Chevaux said. These lists are easily customizable and can be reordered by priority. To Do Lists can be assigned to different people in the family and shared by email or text. Cozi also offers some pre-made lists, such as the Vacation Planning Checklist and Vacation Packing Checklist. The Planning Checklist is great for making sure everything is handled before vacation, like getting your passport, requesting time off work and arranging a puppy sitter for Fido. The Vacation Packing Checklist will ensure nothing is forgotten before you leave the house, or left at the resort when you’re ready to head back home. Just re-check your list and make sure you leave with everything you brought, including those cool souvenirs. This feature is perfect for family vacations where the family plans to have most of their meals at their Airbnb or beach rental. It works just like any other grocery list, but if you’re using Cozi Gold, a premium version of Cozi, everyone can add to the same shopping list. Newly added items are updated in real-time with alerts (alerts can be turned on or off). So, if mom has already left for the store and someone decides they want ice cream for dessert, they can simply add it to the list and the item will pop up on mom’s shopping list. Cozi users can also go to the home screen where the most recently updated information will be displayed. Love using TripIt? Cozi integrates with TripIt at no additional cost. Users will need to allow this feature to work from both apps, which can be done by following these instructions. Cozi’s Family Journal feature is great for recording family moments that you can cherish forever. The Journal lets you add an image with the date and caption, so you’ll always have those memories to look back at. It’s a fast and simple way to share memories, which can be done via email/newsletter or shared as a webpage. The newsletters are sent on the first of each month and sends out any journal entry that was added from that previous month. Last but not least, the ability to receive real-time updates is crucial for organization and timeliness. “When updates are made in Cozi to the calendar, lists, and other features, the changes are visible to everyone in the family across all devices used by the family,” she said. That includes mobile phones, tablets, desktop computers and laptops. Updates can even be made using Amazon Alexa. Each family member has the ability to personalize their settings and determine which alerts they would like to receive. For example, the parents may want to be alerted when items are added to the grocery/shopping list, but the children may not want to be bothered with those alerts. Each person can also choose how they receive their alerts (email or device notification). It’s important to note that time zone changes are not reflected automatically in the app. The original time zone for the family will remain, but it can be changed in the account settings. The great thing about Cozi is that it’s not just for vacations. 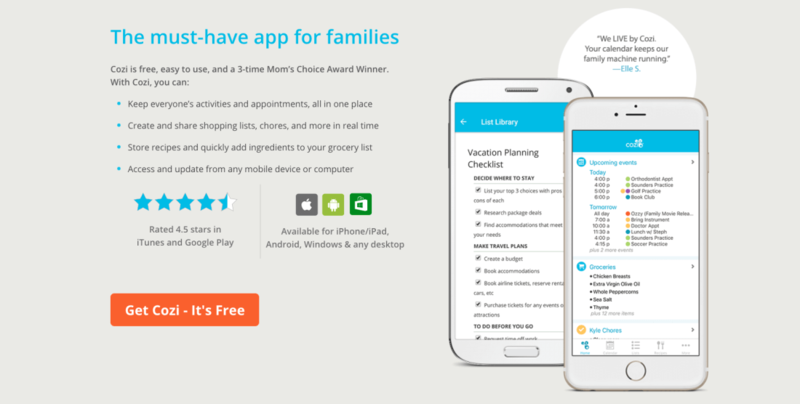 Families everywhere rave about how helpful Cozi has been for keeping their family organized in their daily lives. Cozi aims to continue making life easier for families big and small and are always listening to suggestions from their dedicated users.